This satisfying Chamomile tea is cherished by many as the soothing answer for life's complications. 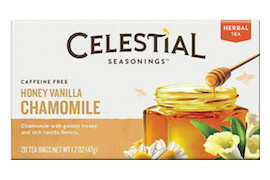 Celestial has added the delicious flavor of creamy vanilla, along with golden honey and just a hint of refreshing orange to complement our perfect blend of Egyptian and Mexican varieties of chamomile in this relaxing herbal tea. Ingredients: Chamomile flowers, orange peel, natural honey vanilla flavor with other natural flavors, licorice root, roasted chicory root, and lemon grass. Contains soy lecithin.